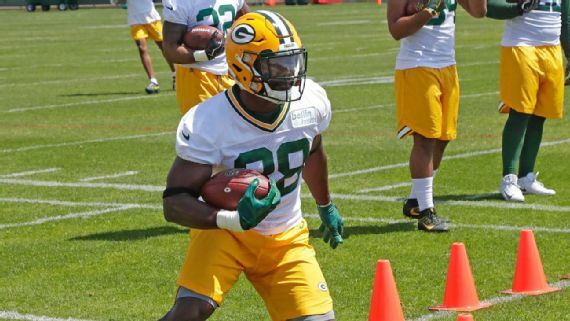 GREEN BAY, Wis. — Mike McCarthy would love to see what Ty Montgomery can do if he’s healthy. The Green Bay Packers coach still believes the receiver-turned-running back could be a matchup nightmare for defenses. That’s why even though Montgomery has yet to prove he can avoid the injury bug, he appears to be set for another significant role in the offense. That much became evident during three weeks of OTA practices, in which Montgomery didn’t appear to lose any ground to emerging running backs Jamaal Williams and Aaron Jones. Montgomery opened last season as the Packers’ starter but broken ribs and a wrist injury ruined his first season as a full-time running back. The success he had during his midseason position switch in 2016, when he averaged 5.9 yards on 77 carries, never returned. He gave way to Williams and Jones, two of the three running backs the Packers drafted last year. Williams showed workhorse ability, leading the team in both carries (153) and rushing yards (556). He tied Jones for the team lead in rushing touchdowns (four), although Jones played with more explosiveness and averaged 5.5 yards per rush. Both, however, battled knee injuries as rookies. Kizer vs. Hundley: DeShone Kizer still has a ways to go to challenge Brett Hundley for the backup quarterback job. However, a couple of things stood out about Kizer: He strikes an imposing figure at 6-foot-4 and 235 pounds, but it’s also apparent that he’s still working through some of the accuracy issues that hampered him as the Browns’ rookie starter last year. One sign of progress came last week when he threw a perfectly placed fade to tight end Marcedes Lewis for a touchdown in a red zone period. McCray and a question mark: One-half of the right side of the offensive line issue appears to be answered: Justin McCray is a virtual lock to start at right guard. The second-year pro played all over the line last year but now has the chance to settle in at one position, and it has been a major benefit. Right tackle, however, appears far from settled. At the last open OTA practice, Adam Pankey manned that spot with the first team. Pankey, an undrafted free agent in 2017, did not play a single snap on offense last season as a rookie. Bryan Bulaga won’t be ready for training camp — or possibly the regular season — because of his ACL recovery. Jason Spriggs is still dealing with a knee injury, and Kyle Murphy (foot) hasn’t been fully cleared. That’s why the Packers signed veteran journeyman Byron Bell last month. Alexander, Jackson shine: The real test will come with the pads on in camp, but the Packers’ top two draft picks already have shown a penchant for finding the football. Jaire Alexander picked off Rodgers during an open OTA, and Josh Jackson had a big pass breakup during a closed session. Pettine’s D: One thing about new defensive coordinator Mike Pettine’s practices: they’re not quiet. Pettine isn’t shy to point out mistakes, but that’s nothing compared to new linebackers coach/run game coordinator Patrick Graham. The former Giants and Patriots assistant can be heard from just about anywhere on the practice field. It’s all part of Pettine’s plan to hold his players accountable, something that was lacking at times under former defensive coordinator Dom Capers, according to some players.